Over the weekend, we installed more than two hundred nesting boxes for swifts in all homes of Murad Buildings! • In search of food swifts can fly up to 500-600 km per day. This is similar to Tashkent people that travel to Sukok to enjoy mountain barbecue! 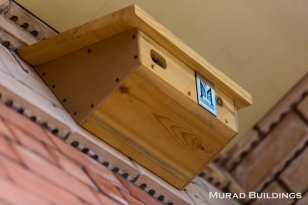 We have decided, that from now, on all of new homes of Murad Buildings we will establish nesting boxes - one for each apartment.